For myself, I use this poem as a charm. First, I mentally erase the title and forget the effort it took to make the poem seem effortless. Then, whenever I need to calm down and get my soul-train back on track (it derails frequently), I repeat the eight lines silently to myself. However many times it takes. If something in you responds to the words of this poem, please use it for your own purposes, however you wish. Harriet Ellenberger was an activist in the U.S. civil rights and anti-war movements and a founding member of the Charlotte (North Carolina) Women's Center (1971). She founded and edited the lesbian feminist journal Sinister Wisdom with Catherine Nicholson (1976-81), was a founding member of the bilingual feminist bookstore L'Essentielle in Montreal, Quebec (1987), published a small feminist journal on the web called She Is Still Burning (2000-2003), and co-edited with Lise Weil several issues of Trivia: Voices of Feminism (2004-8). For the last nine years, she’s been living in rural New Brunswick, Canada, working with her partner to rebuild their old farmhouse. She’s an advisor to Trivia: Voices of Feminism www.triviavoices.com and a featured contributor to “Return to Mago: Magoism, the Way of WE in S/HE” www.magoism.net. 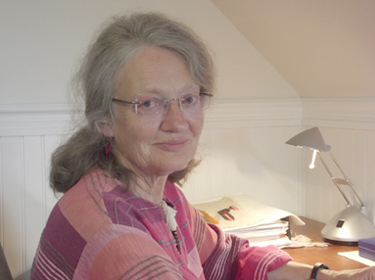 Her most recent writing is slowly materializing on her website at www.harriete.org. She can be reached at akadesmoines@gmail.com. Personal note: When I write a bio, it always feels like I’m filling out a job application form, or taking notes for my own obituary. Just before my mother’s hundredth birthday (she died three days afterward), she looked in the mirror and said, “That’s NOT me.” Well, my bio is not me either, nor is the “serious writer” photograph that I talked my partner into taking and which then alarmed me by the fatigue it showed in my face and body. I am tired, but … that’s not me. In my imagination, I’m just setting off on this journey. I’m hoping Earth feels kind of the same way.